The lusheng (Traditional Chinese 蘆笙, Simplifed Chinese 芦笙) is a mouth organ played by various minorities in China and neighbouring countries, such as the Dong, Gelo, Lahu, Miao (Hmong) and Shui. In older texts it is sometimes called by the name lusha (Traditional Chinese 蘆沙, Simplified Chinese 芦沙). 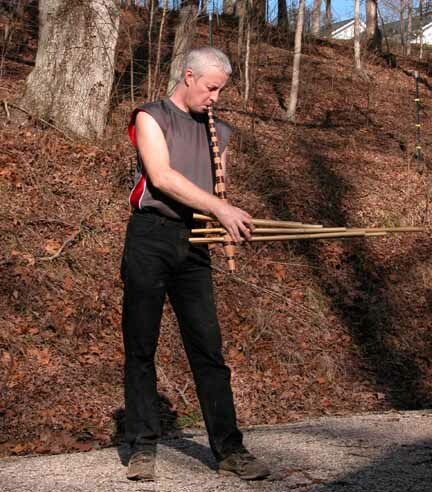 It usually has six pipes arranged in two rows of three, ranging in size from the small example shown above, to instruments with pipes of up to four metres in length. Although the pipes protrude through the bottom of the windchest in a manner similar to the those of the hulusheng, the pipes are closed near the lower end. 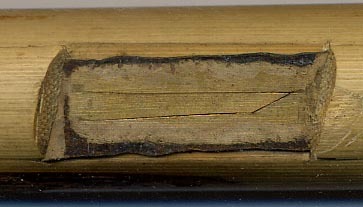 Often the upper ends of the pipes have additional resonators added to them and in some cases one of the pipes might be fitted with multiple reeds to emphasise a particular note. The lusheng is most commonly used to provide the music for festivals, funerals and shamanic rituals, sometimes with large ensembles of differently sized lusheng playing in unison. Amongst the Miao (Hmong) people, the lusheng (known in the Hmong language as gaeng or qeej) is both a vitally important cultural emblem and a means of communicating with the spirit world. 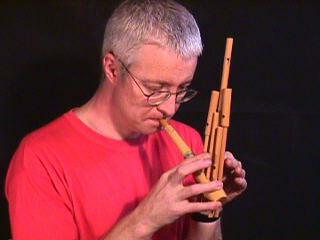 The highest pitched pipe on this instrument has a larger diameter than the others and has two reeds set into it, each tuned to the same note. Inevitably, "improved" lusheng have been introduced with additional pipes to give a wider musical range and semi-professional groups of lusheng players are often to be found entertaining tourists with decidedly non-traditional pieces. What Is A Free Reed?